Final Fantasy XIV ShadowBringers Expansion Announced! PUBG Arrives On PlayStation 4 Next Month! Dragon Ball FighterZ has been getting a lot of burn since it’s reveal shortly before E3 2017, and rightfully so. It’s been a long while since a 2D-style Dragon Ball fighting game has been produced, however, this is most certainty the one fans have been waiting for all of their lives. New information regarding the game has been rolling out quite frequently, pretty much on a monthly basis – with majority of this months news recently being rolled out during Gamescom. A new gameplay trailer was recently released during Gamescom, which features a few newly announced characters (Androids 16-18) for the game, along with a short glimpse into the games story mode. Along with the newly released trailer, a Special Edition for Dragon Ball FighterZ entitled the “CollectorZ Edition” was also revealed, which includes a slew of awesome items that I’m sure every die-hard DBZ fan will want to get their hands on. 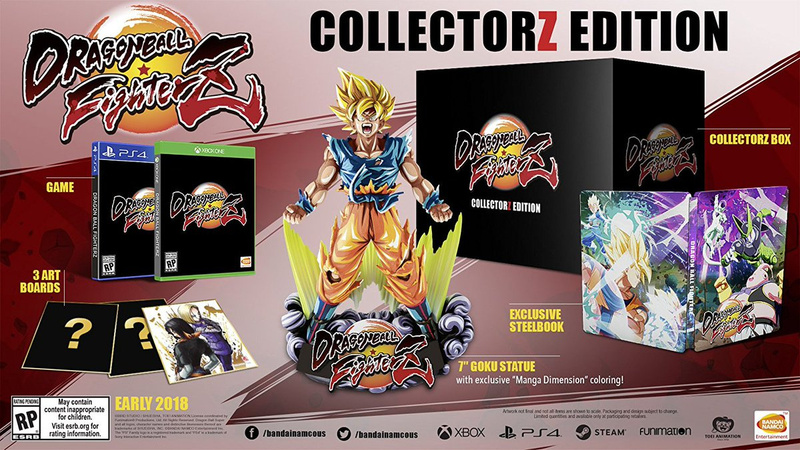 The CollectorZ Edition includes 3 Art boards, an exclusive steelbook, an 18cm Goku diorama, and of course the game itself. Dragon Ball FighterZ is one of the upcoming Fighters that I’m a bit more anxious to finally be able to play, so I’m definitely looking forward to the open beta which is currently slated for sometime before the end of 2017. Dragon Ball FighterZ launches on Xbox One, PS4, and PC in early 2018.